The City of Oneonta, Blount-Oneonta Chamber of Commerce, the Oneonta Beautification Board, and the Oneonta Business Association are teaming up to spruce up the City for this summer's upcoming activities and events! 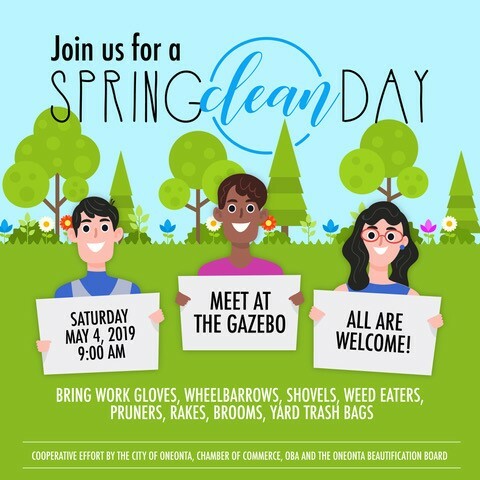 Bring your work gloves, wheelbarrows, shovels, weed eaters, pruners, rakes, brooms, weed killer, yard trash bags, and more! We'll meet at 9 a.m. at the Gazebo and then branch out to work different areas of town. Pat Clanton, board member with the Oneonta Business Association, will be in charge of hospitality and will have bottled water and snacks at the gazebo for the duration and will be able to assign late-comers to a needed task. Check back for a volunteer sign-up that will be available by April 15, 2019.